More light verse–credit to Fearless Linda. 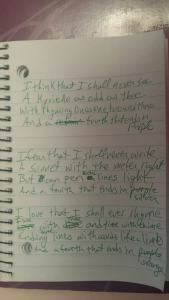 After writing my first Kyrielle yesterday, I apparently had Kyrielle rhyme schemes on the brain when I went to bed. Once the lights were out, the first stanza of one with the rhyme scheme in which the refrain does not rhyme started forming in my mind. When I had repeated to myself four or five times I realized it wasn’t going to let me sleep, so I flipped on the light and write it down in the notepad I keep on my nightstand. It’s kind of silly, but silly is good sometimes.